The final weeks of my college career at Drake University are approaching, and I am more than ready to graduate – fingers crossed that I will, of course. 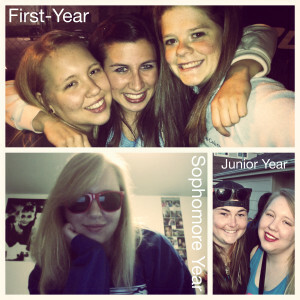 But the closer I get to graduating, the more I begin to reflect over my past four years at Drake. Here are some of my greatest (and favorite) achievements from over the past four years. Last semester I took Social Media Strategies and we created a little video called #DrakeUnfiltered. The video is a compilation of one to two second clips from various Drake students. These are just clips of their every day lives. People would send our class their clips and then I compiled them together to create one brilliant “short film.” The creation of this video taught me so much and I am so happy that I got to be a part of such a fantastic project. And instead of just talking about how great #DrakeUnfiltered is, I’ll show you and let you decide for yourself. Another huge accomplishment of mine that I am extremely proud of is being Editor-in-Chief of DUiN, the Drake University Independent Newspaper. During my entire senior year, I dedicated much of my life to creating two hilarious, smart, and witty issues of DUiN. One came out in the fall of 2013, while the other came out this very week. I am so proud of my staff and myself for creating two magnificent issues. I couldn’t have done this without them this year, so thanks staff, you guys rock! And, this final point is not so much an accomplishment as it is just unforgettable – I am speaking about none other than the Drake Relays. As my final Relays begins, I look back on my past three. I did not really know much about Relays when I chose Drake, but now that I do, I am so glad that Drake is my second home. It makes me beyond happy to see the Drake community come together to celebrate. Bulldogs past and present join forces at the Drake Relays, and it could not be more fun! Everything I have learned at Drake – in and out of the classroom – has been life changing. I couldn’t have asked for a better four years in college. Granted, there were some pretty deep lows, but it’s the limitless highs that I will remember forever. The best piece of knowledge I can pass on to others is to always take risks and live in the now. You will make mistakes and get hurt, but you’ll learn from them. There’s no reward if you don’t take any chances. Ultimately, it’s up to you, you can play it safe or you can live on the edge and experience all life has to offer. What will you decide?